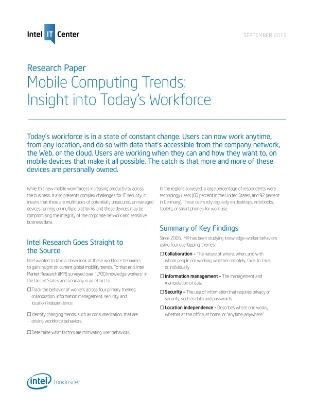 Thanks to the rise of mobile computing, today’s workers are able to work where and how they want. While this means a welcomed increase in productivity and operational efficiency, organizations also now have to deal with the increase in user-owned mobile devices in the work place. What does this mean for the modern business? This exclusive paper takes a look at the latest enterprise mobility trends, focusing on the mobile workforce and what your organization can do to get the most value from your employees.